Learn how to make clarified butter, an easy process that removes the water and milk solids from whole butter. Use it for Hollandaise and many other recipes. In a small saucepan over low heat, warm butter without boiling or agitation of any kind. As the butter melts, the solids rise to the top and water sinks to the bottom. Sometimes the solids appear to bubble up from the bottom. When the butter is melted, skim the milk solids from the top using a ladle or slotted spoon (see notes for ideas of what to do with the solids). When the skim solids have been removed, transfer the butterfat to a clean saucepan or bowl using a ladle. Leave the water in the bottom of the original saucepan. 1 pound of whole butter will yield approximately 12 ounces clarified butter. The clarified butter can be kept in the refrigerator or freezer. Adapted from "Procedure for Clarifying Butter" in On Cooking. 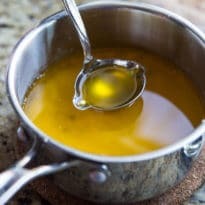 To put your butter solids to use, lightly brown them in a small amount of clarified butter to make "browned butter." Then, add to cookies, vegetables, soups, mashed potatoes for extra butter flavor, or use as a condiment on bread.